Type-2 diabetes is becoming more and more prevalent in this country and huge numbers are pre-diabetic, yet most people still do not realise the implications of this illness and that it isn’t ‘just a sugar disease’. It’s a metabolic disorder that has far-reaching consequences when it comes to the quality of your life, your health and even your life-span. For instance diabetics have a two to four times higher risk of heart disease, stroke and cardio-vascular related deaths than non-diabetics. It is the leading cause of blindness in the US, and also the leading cause of kidney failure. It increases the risk of several types of cancer, damages your nervous system and is responsible for a huge number of limb amputations. These facts should be a wake-up call for anyone who already has diabetes, is pre-diabetic, or has metabolic syndrome, but there is another risk that should be considered. When you think of diabetes you think of blood sugar levels rising too high but your glucose levels can also drop too low, which is known as hypoglycaemia. This can happen quite alot with diabetics especially if you skip meals, and can be quite common in those taking insulin or other diabetic drugs. When your blood sugar levels drop you can feel weak, dizzy, drowsy, confused and disorientated and if it drops too low you may even lose consciousness. This in itself is a huge health concern, but unfortunately it may also be a sign of things to come. New research has found that those people with diabetes who have hypoglycaemic events are more inclined to lose their mental capabilities and it doesn’t take that long to happen! The new study was carried out at the University of California, where they recruited 800 people between the ages of 70 and 79. All of them had type-2 diabetes but none of them had dementia at the beginning of the study. Over the next 12 years anyone hospitalised with hypoglycaemia had twice the risk of developing dementia. During the study they also discovered that those patients with dementia were not always able to properly control their blood sugar, so they were twice as likely to have severe bouts of hypoglycaemia. 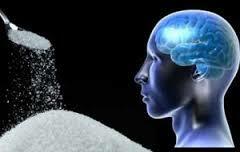 This created a vicious circle, the more frequent instances of severe low blood sugar, led to greater cognitive decline. Then the worse the cognitive decline, the more often their blood sugar dropped. So what can you do to reduce your risk of mental decline? The first thing is to make sure that you are not eating high glycaemic foods that will send your blood sugar sky high, and secondly that you eat regularly so that your blood sugar doesn’t drop too low. You should eat healthy meals and snack frequently between meals. Avoid processed foods and all foods with added sugar. For your meals eat lots of green vegetables and a little protein such as chicken, fish, eggs or beans. For your snacks you can have fruit, which although they have sugar in, are relatively low glycaemic because of the way the fibre in them works with the fructose. Also for snacks you can have nuts, raw carrots or celery. Most of the other root vegetables are quite high glycaemic especially potatoes, parsnips and beetroot,so it is best to avoid them. It is not easy to keep your blood sugar on an even keel so I would also recommend taking a supplement that helps. The one I use is Glycaemic Complex and is an advanced formula that delivers a blend of targeted micronutrients and herbs that support glucose metabolism. It also combines powerful antioxidants and other nutrients to help support circulatory health and tissue repair and is a great supporter of any issues associated with long term raised blood sugar. There’s also a natural compound called chlorogenic acid. It’s found in coffee and tea, so you might already be getting a little from your diet. Chlorogenic acid helps block the absorption of sugar in your intestines, and suppresses your liver from producing glucose after a meal so it helps those swings from hyper – to hypo-glycemia between meals. So, think twice before you eat that processed meal or that sugary pudding, especially if you are diabetic, but even if you are not, this is a better way of eating and will help to keep your blood sugar more level, preventing the sugar highs and lows that can cause so many problems later in life.